I love being invited to game day parties. Mostly though I love eating the food. Make no mistake, I am in it for the food. So, it doesn’t matter who you are rooting for, here is another oh so simple recipe you can make for game day. When this is done, place the crock pot of chicken wings on top of the coffee table in front of the widescreen TV. No silverware is necessary (cuz this is finger food!) and to make the seventh inning stretch snacking perfect pass around paper plates and (no—no napkins!) paper towels. Just try your best to ignore the sucking and squeaking sounds your friends and family are going to make while “dining.” Yeah—and put out the other stuff you made too. This is a fun seventh inning stretch treat. The only advance tip I can give you is. . .make plenty! They’re popular and they go fast! 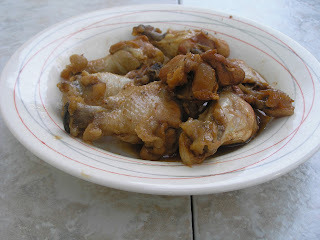 Cut the chicken wings into three pieces. In a small bowl combine barbecue sauce, maple syrup, sugar and worcestershire sauce. 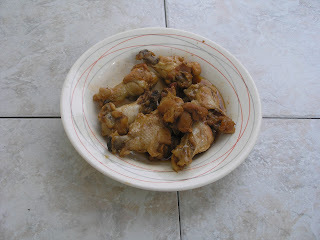 In slow cooker place the chicken wings. Pour the mixture over the chicken wings. Found this and I’m looking forward to trying it. BUT, don’t throw away the tips – they make a good broth. Throw in your freezer and make a broth of those and other bones and peelings and scraps some Saturday or Sunday you’re home all day!